Digital Bridge is trying to bring devices and internet access to those who do not have it already. Jeff Hanson founded the nonprofit in 2013 after graduating from the Milwaukee School of Engineering, where through a student program, he had the chance to set up a computer lab in Kenya. "How much that had an impact on their village had a big impact on us too," Hanson said. He realized this demand is just as great here at home. According to the latest census data, 23 percent of Milwaukee households, or nearly 53,000 households, have no internet access. So Hanson has made it his mission to provide affordable technology and internet access for low-income families in the community. He realized the way to do that is by refurbishing used devices from local businesses. A certified worker wipes the drives or crushes defective ones, and volunteers get them ready for new users. "You wouldn't know where the computer came from," Hanson said. Some may be in computer labs, which they've opened across the world - 25 to be exact - in Kenya, Cameroon, Sierra Leone, Uganda, India, Jamaica, Guatemala, Mexico, China, and the U.S.
Others are sold through their online store. Then there's their new workshop series, Bridge Milwaukee, which they're bringing to various local nonprofits. It's a training program, where residents can learn computer skills and get ones for free. They piloted it with City on a Hill in Avenues West, a group that offers youth programs, a free clinic, housing and other services for members of their neighborhood. Executive Director Diane De La Santos said the digital divide is a big problem in the community. "Things that some of us take for granted, whole neighborhoods lack," De La Santos said. "You're expected to apply for jobs online. You're really expected to have those skills. If you don't have them, you're just that much further behind," Hanson added. Now as they continue to grow, they hope to help others like Coleman. "I am grateful because not many other children within the city have the opportunity that I had," she said. Last year Digital Bridge refurbished more than 100 tons of electronics. 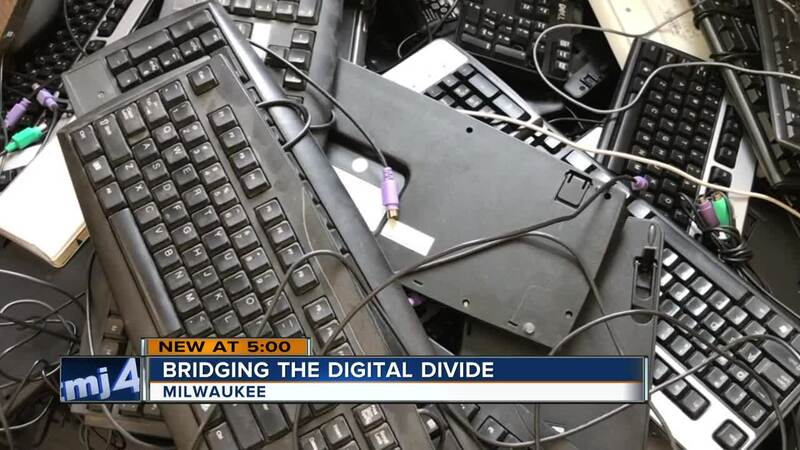 For more information on Digital Bridge and how you can get a piece of technology, donate or recycle your technology, volunteer or partner with Digital Bridge, click here .